I am cursed like that. And then I just go my own way...a trait that has had frustrated a few art teachers in the past causing them to ask me just to get a refund. I mean, seriously. I can take a hint but geez! Some people really WANT you to follow their directions. Sigh. 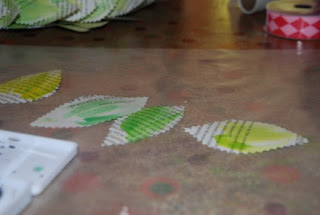 So the first thing I did was cut about 100 paper leaves. I stacked up five pages and then just free-hand cut out shapes...roughly the same size...between 3 and 3 1/2" long and 2 and 2 1/2" wide. 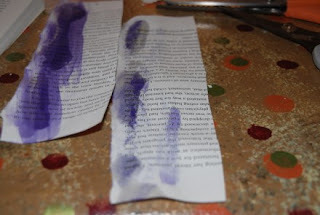 Then I put them on waxed paper and used green and yellow watercolors to add some tint to them. I actually made them fairly damp so they would curl up a bit for texture on my wreath. Then I let them dry and started attaching them to the wreath form with hot glue. At first I tried sticking them down with a pencil eraser but I have pretty tough fingers so I quickly abandoned that. I layered them on the sides, too, to make sure the wreath form wouldn't show. 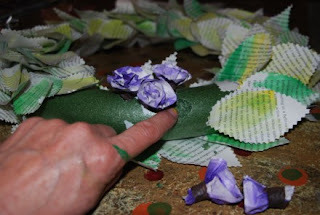 Put the hot glue on the front of the leaves that are going on the side of the wreath so the color wash shows. The leaves on the top of the wreath need to have the glue on the back. You would probably figure this out right away but it took me about 5 inches of wreath to get the hang of it. Just keep going around your wreath until it is completely covered in leaves. At least that's what the directions say. 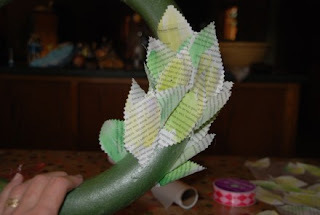 I am thinking in the leaf gluing process how cool paper roses would look instead of a bow. 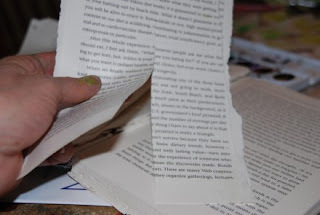 So what I did was rip the edges off both sides of some pages and then cut them in half lengthwise. 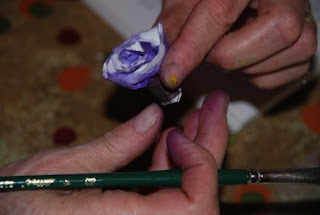 Then I smeared watercolor all over the edge and while it was slightly damp rolled it into a flower. I'll show you how in a minute. The first one I made was pink-y red and I thought it looked boring with the leaves. 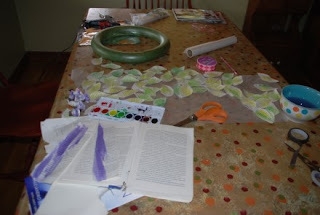 So then I made purple ones which were a whole lot prettier with the greenish-yellow of my wreath. I think they turned out quite pretty. I'm going to show you how I did it but don't be distracted by my paint covered non-hand-model hands. They are old. But I like them anyway. But you may not like them and think "OMG! 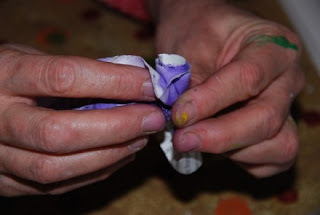 Look at those old, paint covered hands and close this post and then you will miss out on the glory that these paint smeared leaves will become! 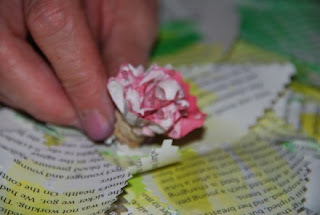 Disregarding the hands, here's how I made the flowers. 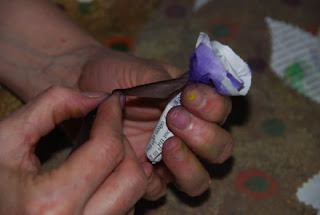 If you want your flower to be bigger add on more sheets of paper... ...and then pinch the base of the flower together, wrap it with florists tape... and then cut off right below the florist tape. 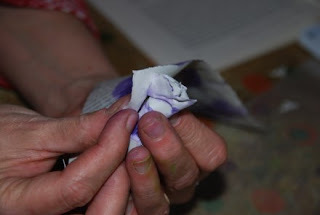 Carefully fluff up the flower a little bit and then put more watercolor on if you like. 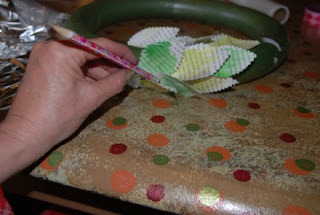 Make your flowers different sizes by simply using more or less paper and pinching farther forward or back before you wrap the base with floral tape. Just mess around with it. 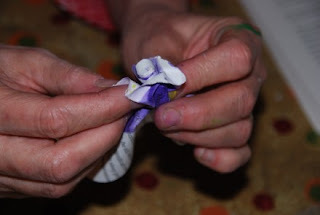 There is no cost involved and although you may end up with several ugly flowers while you practice it is actually kind of fun once you get the hang of it. At least I thought it was mostly fun. Except for the brief time when I was making my paper flowers and I had a bad flashback to the one and only time I was arrested in my life. 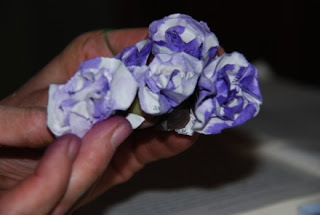 I actually made similar flowers to these in my little jail cell out of paper cups but I didn't have any florist tape or watercolors so they weren't quite as lovely. But that whole sordid tale is a story for another time. Because here at Jenny Matlock I am always on track. I never divert from a given course. 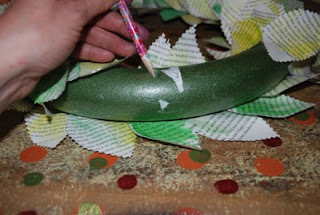 When I got to this part of making the wreath I ran into a little snag because the flower has a kind of thick base that made it hard to attach to the wreath. I like the idea of making one in fall colors, too! And now I need to go make a smaller one for a gift for a sweet girl I know! And if you make one send me a picture, OK? I want to see what happens when you don't follow my directions! This post is linked to Trendy Treehouse! PS! This wreath is brought to you by Oskar and my inability to follow directions. PPS! On Friday I am going to do my Lisa Leonard jewelry giveaway. Yes, I know I've written scathing posts about him and his propensity to tinkle on the floor. And I've written other posts about how strange he is in general. But today last night I feel in love with my weiner dog, Oskar, all over again. And it is because of this! I saw this really cool wreath recently here and I became enamored of making one. He did not share my enthusiasm. "What books are you going to cut up to make this?" he said. "Don't worry, it won't be any of yours," I replied. 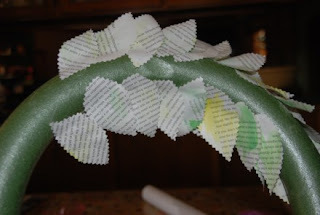 So I dug through some paperbacks languishing in the back of the bookshelves and I put two on the table along with my wreath form and hot glue gun. Oddly, the books disappeared. "Where are my paperbacks?" I asked him. "Oh, I might want to read those someday!" he replied. "You want to read some books about lustful maidens falling in love with their gardeners/and or stablemen?" I asked sarcastically. "Well, you never know...I just might," he said, and then he added, "that wreath looks dumb anyway!" So I dug further and found another book and put it on the table. Apparently he might want to read a book someday about exercising your face followed by a book about eliminating boll weavils in the cotton fields. He is dumb like that. But last night my weiner dog, Oskar, made me love him. We had taken our granddaughters out to a little picnic at the playground and got home quite a bit later then usual. And now, my friends, I can make my wreath! I just love that dog! 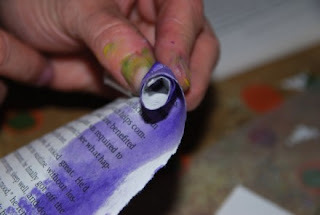 And if you want to make this wreath and run into the same problem...you may or may not want to try rubbing some meat juice (ewwww) on a book you don't want. ...when I tell you I am greedy person. Hey! Look at that! I need a pedicure! Distracted for a moment. Back to head hanging in shame and not looking at toenails. 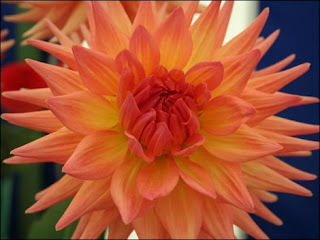 I am greedy because yesterday I went to Home Depot and bought this wonderful bounty of flowers to plant in the garden... I brought them home and hauled them back to the garden. But I need a farm. I want a farm! I demand a farm! 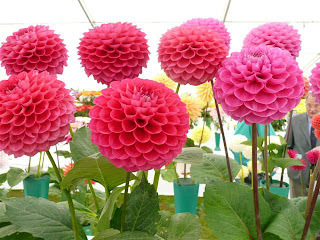 There are too many amazing and gorgeous varieties and I need them all. I want them all. I demand them all. How can I go to Park Seeds and not buy enough seeds to plant an acre of this... 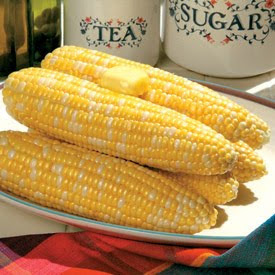 Here's what the catalog says about this corn...By far the sweetest-tasting corn ever grown, and also the most tender! 76 days. Its name means "the future is almost here," but once you taste your first bite of Mirai® Bicolor Corn, you'll know that's wrong -- the future IS here, and its name is Mirai! This ultra-supersweet corn is so sugary and succulent that it gives new meaning to the term "caramel corn"! And to make it even worse it comes in yellow and white varieties! That is three acres of corn! Which means I need a farm. I want a farm! I demand a farm! Sure I know I'm supposed to be happy with what I have. And I do have nice gardens. Really I do. But they can only accomodate 1/1,000,000,000th of the seeds and plants I need to try. I want to try. I demand to try! I already have 5 acres planted on my imaginary farm and I haven't even told you about my obsession with zinnias, sweet peas, larkspur, asters, tomatoes, heirloom vegetables...etc., etc., etc. And I need a pedicure. And no matter what people say CONFESSION IS NOT GOOD FOR THE SOUL! Because I still don't have a farm. Do you know the song "If Heaven" by Andy Griggs? It is a lovely, sentimental song. If you haven't heard it is number 6 on my usual playlist which will be back up again tomorrow. I cannot hear this song without being transported back to the enchanting years when my children were small. I hear their laughter ringing out clearly through the dark night in excitement as they chased the elusive flickers through the velvet-soft, evening-damp grass. I feel their joy in holding a twinkling bit of magic in their small hands for a moment. I see their three little blonde heads bowed together in harmonious awe and wonder. And I cannot hear this song without remembering catching fireflies with my own sisters. These memories are as tangible to me as the keyboard I am typing this on. I can close my eyes and capture that scent of mowed grass with just the smallest hint of fleeting time whispering around the edges of the memory. I think of so many children today and I am saddened. Who do these children grow up to be when their childhood is forfeited in pursuit of their parents desire for more money and bigger houses and always more stuff? Where do these children learn their value of self when their parents cannot pull themselves away from their cellphones, PDA's and internet games to share a sorrow or a joy, to read a book, or to soothe a nightmare? How do these children become caring and compassionate adults when they are raised without kindness and imagination and someone willing to kiss their boo-boos and nurse their sicknesses? When will these children learn about humanity and the art of giving when they are surrounded by nothing but the selfish pursuit of self-interest? At the preschool and the school I see so many children just looking lost. They are already tired before they have even begun. And I sit and listen to that song and I send up a simple wish along with my tears. That these children with lost eyes and bruised hearts can somehow, someway find a firefly to hold in their hand. 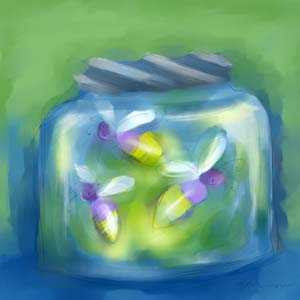 This post is linked to Alphabe-Thursday. If you are visiting from SITS and want the full, long, boring instructions on how this weekly MEME giveaway works just click on the Alphabe-Thursday button at right! I would highly advise you drink a lot of caffeine first! In a nutshell linked posts are put into a drawing after certain letters. The next letter is after the letter "I" for a $25.00 gift card. Each link on the McLinkey counts for one entry. After the letter "Z" there is a gift card giveaway for $100.00...again, each weeks entry counting as one chance. For those of you new to the classroom my name is Mrs. Matlock and this is Alphabe-Thursday. 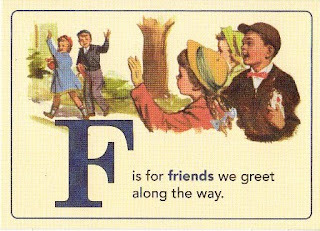 Today we will focus on the letter As you can see, F is a nice letter used for F rivolity and F riends. There is a dark side of the letter F but since only PG posts are allowed on Alphabe-Thursday we will not have any of that tom- Foolery in this classroom. NosirreeBob. or Kathy. or Susan. Or Linda! Your linked post for this letter counts toward the second Alphabe-Thursday prize. If you've forgotten how the giveaway works just hit the Alphabe-Thursday button to the right. It will take you to the long, long, long explanation post. If you have any other ??? 's about Alphabe-Thursday or problems doing your link just post it in a comment or send me an e-mail. I'll do my best to help you. And remember.... link back to this post, PG posts only, and try to visit all the other students! The links will stay live after the final post deadline has passed so you can even wait and visit over the weekend or whenever you have more time. Please file your letter "F" papers in the McLinkey now, Class. I have failed at Wordless Wednesday yet again. Yes...I awoke this morning clear-eyed and focused...ready to face this daunting challenge. How can I be wordless when I need to tell you that when I took Mo to preschool this morning we played our usual game? She sits in the back in her car seat and I sit in the front and we take turn making animals noises. "Mooooo..." I will say and she will giggle and say "Uh oh, there is a cow in the car! Oh that is you Gwamma!" and then we giggle. And then she will say "meeeoooow!" and I will say, "oh no, there is a cat in the car!" and she will giggle and say "Is me Gwamma!" Today she got me, though. After we had exhausted pigs, snakes, ducks, birds and chipmunks she said "poke, poke, poke!" And I said "hmmm... what is that?" So she repeated, "poke, poke, poke!" After a few more questions she finally blurted out..."Gwamma, there is a CACTUS in the car!" Now see? If I actually stuck to my wordless Wednesday plan you would have never heard that adorable story! And how can I tell you that my husband and I attempted to do a Pioneer Woman Word Nerd contest last night and we barely even argued? It was cool. I'm thinking we won although it did take us 26 minutes to do it. I'm thinking PW will let us win when I tell her how romantic it was...doing a Word Nerd contest cuddled together behind my little desk! Awwww.... sweet! And how can I tell you that Vicki has probably eliminated almost all fire risk at my house? It's true. She is a sales rep for the coolest idea I've seen in a long time - Fragrance Fans. Have you heard of these things? I am ordering several just to eliminate my husband yelling at me when we get home when I have left candles burning. Geez...I'm thinking he may need to take some anger management classes since all I'm trying to do is make my house smell good! I hope you visit Vicki by clicking here to see these great products! to eliminate your husband yelling at you, too. Vicki is having a sweet giveaway with purchase right now. And while you're there make sure to visit her second blog. She has a great ongoing pioneer story going on right now...just click the link at the top of her post to visit All My Yesterdays while you are there! Geez. I'm getting tired and my fingers are cramping up. How can Wordless Wednesday be so seriously exhausting? 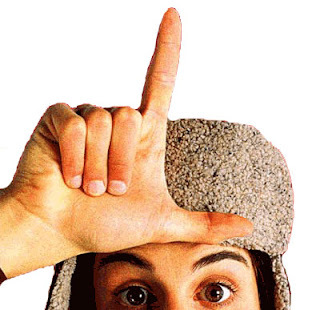 But one last thing. Do you all know PJ? I have to remain wordful just a bit longer so I can tell you that PJ is having a ridiculous (that is the cool word now that means GREAT!) giveaway on her blog to celebrate her upcoming Blogaversary! PJ tells me that not only does she want you to visit her blog to help her celebrate but she's also hoping visitors find "The missing sock, that word that was on the very tip of their tongues but never materialized, their keys, their tempers, their virginity, a good parking space, a self-cleaning family, the ability to remember what they went into the room to get, truth, justice and the American way" while you are there! I think this little quote gives you just a small idea what PJ is all about. Go there! Enter! Read! Find your missing sock or something more personal! She is giving away some great prizes. Wait! What am I doing? If I send you over there then my chance of winning becomes less. Just click here and you will go to her giveaway! I am exhausted. NoSirreeBob, I cannot go any further with this Wordless Wednesday post so I will stop now. But in honor of the sentiment of that MEME I would like to observe a moment of silence now. OK! That was long enough! It's official. I am done writing. There is nothing left I have to tell you. ...don't forget tomorrow is Alphabe-Thursday and it is the letter "F"! No, you hang up first! I am an American Picker Wannabe!!! Driving home from the grocery store with my youngest granddaughter on a Friday morning. We came to a little crunch in traffic so we took a side street home. 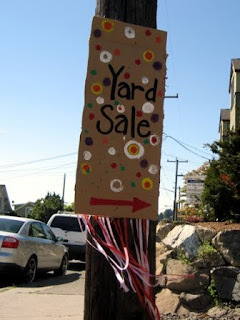 When we turned to head toward our house I saw a little garage sale sign taped to a box. I don't know about you but I have this weird rule about garage sale signs. If they are cute... ...I always make it a point to go check them out. The sign we saw wasn't quite this adorable but I decided we would just head home and not check it out. I drove a few more blocks and got up to a stoplight which had turned red and then I had second thoughts. I told sweet little Miss Mo that we had to go check something out and whipped my car around into a u-turn. We followed the colorful signs and when we pulled up to the curb I saw this!!! It was love at first sight! There were four or five other people milling around looking at stuff so I hopped quickly out of the car, leaving my Granddaughter yelling "Gamma! Gamma!" but I was not to be diverted. But, oh, this little cupboard was so sweet! I could see the patina on the wood and the old boards on the back...oh...I was besotted. My Granddaughters wails caused me to say hurriedly to the lady sitting at the table, "I'll take this!" and then I quickly got little Miss Morgan out of the car. There was no price tag on the cupboard and I think I had only a twenty dollar bill in my wallet! But the cupboard was only $10! And the lady was apologetic about it. She said it was an old piece of junk that she had almost thrown away. She thought it might have been her Grandfathers but she wasn't sure. I gave the lady the $20 and told her just to keep the whole thing and then I wrangled it into my car. Mo looked pretty surprised at sharing the backseat with a child's cupboard. And I felt pretty surprised finding something so cool. I totally adore this little cupboard. Sometimes I put it in my bathroom between the double sinks and put towels on it! Sometimes the Grandkids drag it into the living room and fill it with Pretty Ponies...and sometimes it sits in the corner of my breakfast room looking totally sweet. 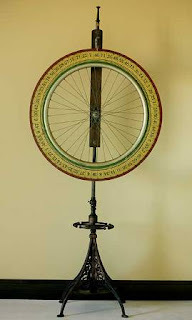 I've toyed with the idea of hanging it on a wall but I don't want to drill through the thick, rough boards on the back. When I was taking a picture to share, Miss Mo wanted me to take her picture, too, so I could show you that she looks just like her favorite little vintage Fisher Price figure. Right down to the yellow hair and the pony tail. Plus you can see what a sweet size this perfect little cupboard is. And this is one of my favorite American Picker finds! Care to share one of yours? Just link up below and we can all come and oooh and ahhhh with you! This McLinkey will be live until Sunday night but you can view the links anytime you visit! Oh! And if you don't know what American Picking is all about just click here to read a post on it! ...I would be so much more emotionally stable. Not only would I be calm and zen-like at all times, I would be able to do amazing things because I would finally have enough time to get caught up reading the towering pile of magazines stacked up for a "rainy day". We've had two gray days here in a row...and it's been awesome. I layed around on the couch with the fireplace crackling merrily in the background and the pile of magazines offering scintillating companionship. I found cool things I need to look for when I get started on my American Pickers career. 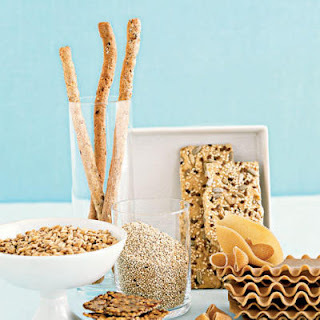 I learned about whole grain varieties in the January Cooking Light Magazine. So now I am not only more relaxed I am armed with potential information I need to get healthier. 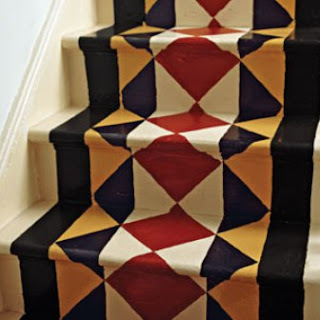 I read how to paint my stairs really neat in This Old House Magazine. A look that I doubt my husband will embrace. And a look that I doubt I will argue with him over doing because I actually live in a one-story house. Which really wouldn't be that big of a deal if I didn't live somewhere that it is sunny 306 days a year. I'm certain that If I just had a few more rainy days I could read about how to add a second story to our house. By myself. For under $37.00. Over one weekend. So if I do the math...I still have about 54 rainy days left for 2010. And since I am all zen-like and not in a big rush and I don't want to stress myself out, I am planning to devote 50 of those rain days to catch up reading my magazines WHICH MEANS I will still have four whole days left over add a second story and to cook up a few of those whole grain recipes as well. Keep your fingers crossed it is a rainy year for us here in the Valley of the Sunstroke. PS Tomorrow I'll share one of my sunny day "Pickers" finds from a garage sale right by my house. Hope to see you then. We traveled north on Saturday. I love my daughter Jessie the best. Sweets for the Sweet - Thursday Giveaway! Most. Creative. Wedding. Idea. Ever.